Pic 2: Alongside a Star Hawk during atmospheric testing. Small, quick, and not all that maneuverable is the Star Hopper, designed and built by HPC, the fighter company best known for their Galidor Class of fighters and gunships, and disgustingly ugly APC or APT or whatever it's called. 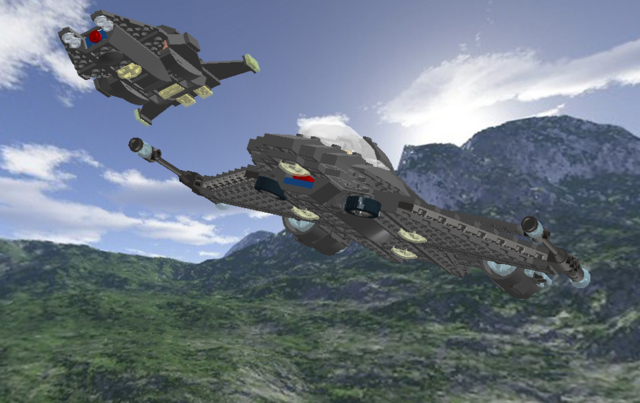 Its small size, streamlined shape, light weight, and powerful engines allow it to accelerate quickly to sublight speeds unachievable by the typical fighter. The sky is not the limit, however, as the Star Hopper is capable of space travel, and its engines are designed to maintain warp speed as well. The Star Hopper lacks however in the handling department. It is responsive and can easily execute an aileron roll, but while it can rotate its body on a dime, it can't necessarily change its direction on a dime. Its turning radius is quite wide in an atmospheric environment. The Star Hopper is thus NOT meant for dogfighting. The Star Hopper is neither all that heavily armed nor armored either. 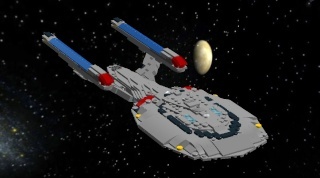 It has two lines of phaser nodes (consisting of two phaser emitters each) installed on its canard wings which are capable of firing short-distance, short-duration, low-power phaser bursts. They can be aimed at a target anywhere underneath the front of the vessel, but it would take at the very least four direct hits to get past the average fighter's shielding. As for its own defenses, the Star Hopper has minimal armor and shielding, as much of the vessel's little interior space is set aside for cargo. And that my friends is HPC Industries latest fail, the Star Hopper; though it isn't all that much of a fail, as Star Force has decided to use the Star Hopper as a Courier. 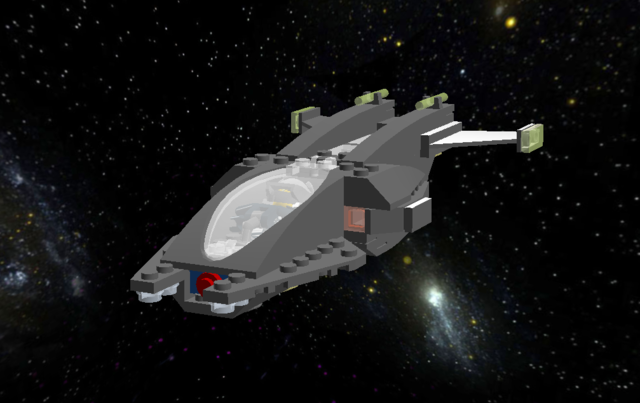 Besides, it's quite the cute aerospace craft, if not the smallest Star Force aerospace craft yet. I like it, mah friend. I can't give that much of a rating on it 'cause the pictures are pretty much the same angle, with the difference being that one is from the top and one is from the bottom. But I can say that I like the small, elevated wings in the back. Reminds me of the LAAT gunships. I personally would suggest that there not be so many studs showing, but that's just my preference. Here Kommandant, I have an LXF file uploaded here so you can download it and look at it from any view you like. Haven't seen any HPC stuff for a while! Glad to know they haven't made another disgustingly ugly APT or APC or whatever it is! I like it! It really is a cute little craft, and the way you built the curves in the back looks awesome! I LOVE IT!!!! It's the cutest toughest "fail" I've seen in a long time! And it's specs are realistic too. I actually have an idea of how this could be a decent success, and that would be to set her up as a close ground support craft. Have her fly low and slow, supporting infantry against light armor and infantry positions. She should be quick enough to avoid the big guns, and sturdy enough to take small arms fire. Her advantage over tanks or bombers? She fills a niche between the two. Although she lacks the armor or firepower of a tank, but it can get to hot spots quickly. And although it doesn't have the brute firepower of a fighter/bomber, it could be quite useful in tight spaces (when coupled with a proper antigrav units, a 20mm photon grenade launcher, and a type IV rapid fire phaser (AKA, heavy machine gun in modern terms)) and that's my idea.